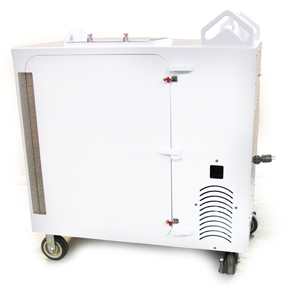 The ClorDiSys Decontamination Cart offers the ability to decontaminate small sized equipment and components inside a small portable chamber rather than in an entire room or a large fixed chamber. This allows for a quicker, more cost effective and versatile decontamination cycle by reducing the amount of time and consumables used. The Decontamination Cart comes equipped with all necessary connections to easily interface with our Chlorine Dioxide Gas Generators. As both the Decontamination Cart and the Gas Generators are easily portable, this allows for a decontamination station to be set up anywhere in your facility. Contaminated components can then be treated near the point of contamination reducing the possibility of spreading the potential risk. Components can also be sterilized before use and then safely moved through the facility without compromising their sterility. All of ClorDiSys' Decontamination Carts are manufactured with the utmost of care and are made of rugged, durable materials to stand up to the demands of high usage. The Decontamination Carts can be easily integrated for use with your new or existing chlorine dioxide gas generator. ClorDiSys' works closely with all of its customers to provide a custom solution for any situation.